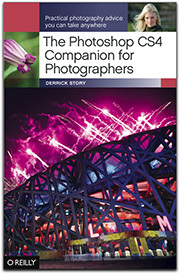 Macworld Magazine just published an article I've been working on for a while, Five Adobe CS4 goodies for photographers. In the piece, I talk about some unexpected helpers found in the bundled Bridge CS4 and Adobe Camera Raw 5. Things like Review Mode, Collections, and the Targeted Adjustment Tool can really make your workflow smoother. This piece is a quick read and provides a nice overview. On O'Reilly Media, I just published Networked Printers and Speakers with AirPort WiFi that shows how I configured my new WiFi network to accommodate several printers and provide remote-controlled music throughout my 2-story studio. It's a lot of fun if you enjoy network tomfoolery.